So many people are walking around in a state of blood sugar imbalance and insulin resistance. I believe that certain societal conditions got us here (hello food pyramid from the 90s with a base of 8-11 servings of whole grains), and information clarifying the way our bodies really metabolize food can get us out. There is still so much confusion, and I see it all of the time in my health coaching practice. What is really fascinating is that insulin's initial biological function and purpose was not to regulate blood sugar at all! There are actually several other hormones that are designed for blood sugar regulation, and in fact, their purpose is to increase blood glucose levels when we need it. When it comes to mechanics of the human body, insulin’s purpose is simply to store away excess nutrients in case of, or in preparation for, famine. This explains so much. Aside from obesity and diabetes, studies are now linking excess insulin to other serious, chronic conditions such as cancer, heart disease, and Alzheimer's. Blood sugar balance is not only about controlling sugar cravings, it is about long-term health. You will find some signs and symptoms of possible blood sugar imbalance listed above. 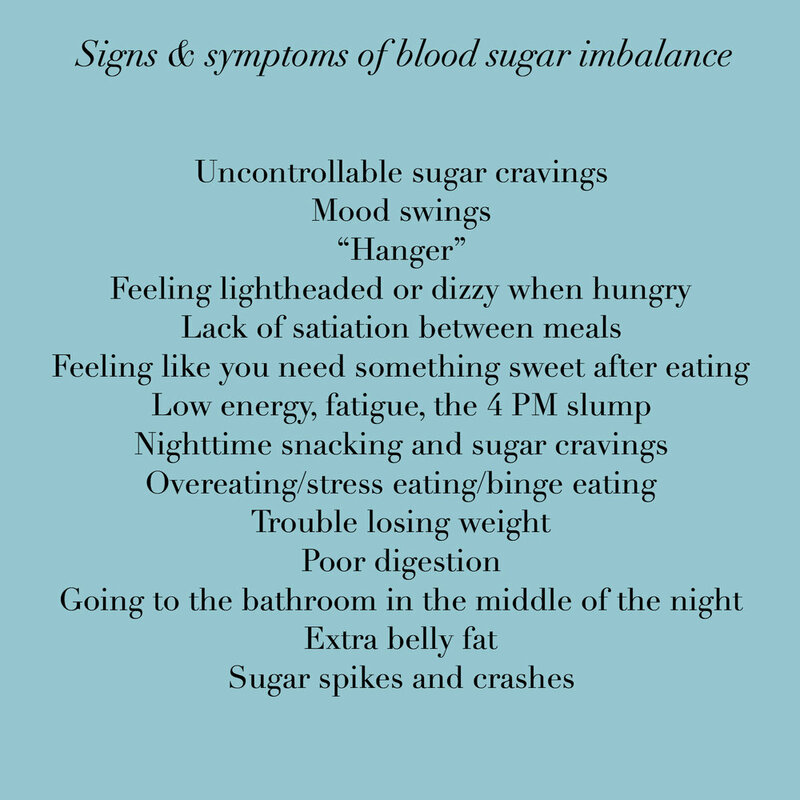 If you feel as if you are struggling with any of these issues, I would encourage you to register for my upcoming online course: The Beauty of Blood Sugar Balance: A 21-Day Real Foods Reset. The early bird pricing ends this Sunday if you want to save your seat at the low price! Feel free to contact me with any questions. Hope to see you in class!